Converting text to speech can be very handy at times, for instance when you have to read a document but no time at hand to actually read it. You could convert it to an audio file to listen to the document in your car, on a train or on your daily morning run. We have reviewed some text to speech converters in the past, like the Windows program Balabolka or the Linux application Festival. 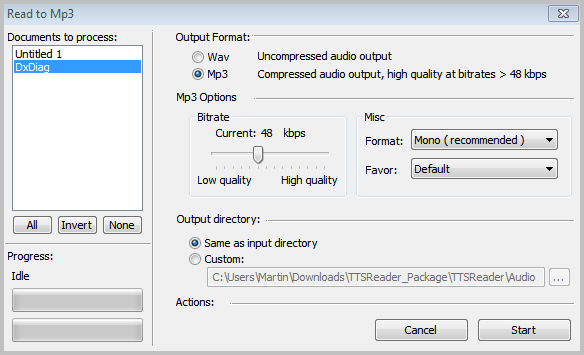 TTSReader is another program for Windows that can turn plain text and rich text documents into mp3 or wav files. You do not necessarily have to convert the files, as it is possible to listen to them directly on the computer. You can paste text directly into the application interface, or load supported document formats into the queue. This way it is possible to add multiple text documents to the program to listen to all of them at once. 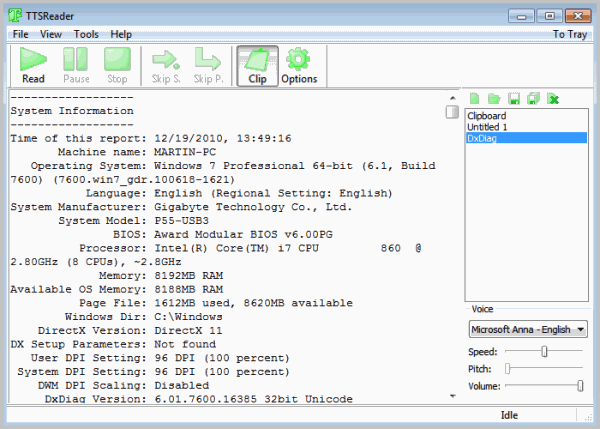 TTSReader uses the built-in Microsoft Text-To-Speech Voice which ships with the Windows operating system. Users who have installed additional voices can select them in the lower right corner of the program. Here it is furthermore possible to change the reading speed, pitch and volume. The active document is displayed in the program interface. Playback controls are provided at the top of the interface, including options to pause, stop and skip sentences or paragraphs. The tools menu lists the available conversion options. You can either select Read to WAV or Read to MP3 there. The menus look similar. It is possible to select one, multiple or all documents that have been added to the queue for processing. The bitrate, format and output directory can be configured on the configuration screen as well. The standard quality settings are a bitrate of 48 Kbps and Mono, which ensures that the resulting audio files are small in size. You can increase the audio quality to 160 Kbps and stereo if you want, which may be useful if size does not not matter. Text to Speech Reader is a nice little application that is offered as a portable version and installer. The ability to convert multiple text documents to mp3 or wav is the program's greatest strength. The lack of support for common formats such as doc or pdf may be a problem for some users, as they need to convert said document formats before they can play or convert them in the software. Probably the easiest way is to copy and paste the contents of unsupported documents into a supported document format. TTSReader is available for download at the developer website. Download links to free and commercial voices are offered at the site as well. This is cool, but sounds a little weird when using it. Is there a better source for voices than microsoft?